Keren Starobinski is a rising high-school senior from Newton, Massachusetts. She has loved mathematics and science ever since she was young. During her spare time she enjoys playing and watching tennis, soccer, and basketball and listening to music. 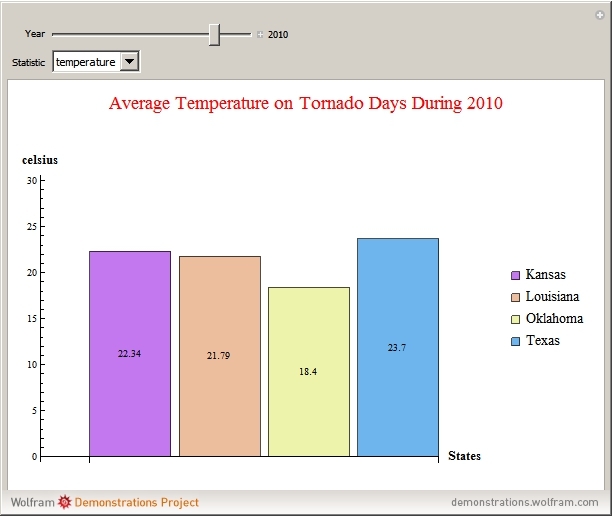 This Demonstration lets the user view the average temperature, humidity, or wind speed on tornado days from 2000–2012. The averages are given for Kansas, Louisiana, Oklahoma, and Texas.